Just to be clear, this article does not include pearl white finishes. See “Three Stage Paint” for your pearl white repair descriptions. Car touch up for white, cream and other “pastel” colored cars has some solid positives and negatives. 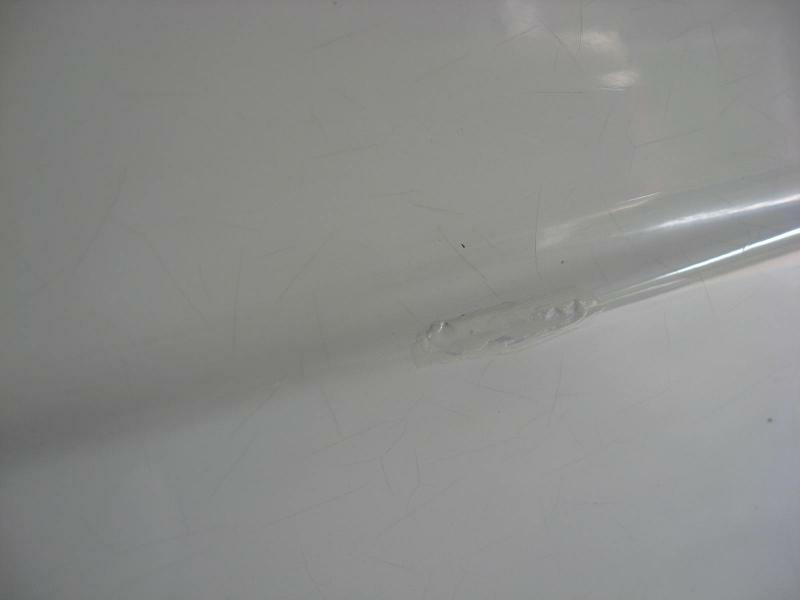 The worst part is that when you damage the paint on a bumper, the material under the paint is usually black. The high contrast is extremely noticeable. When paint is removed to the base material there is a considerable crater left behind. Sometimes the damage gouges deeper into the base material increasing the 3D effects. White is hard to touch up because it shows shadows from 3D effects clearly. Since the damage will still retain some 3D effects, at certain cross angles the sun will cast shadows making it more visible. An upside is that white is blinding in direct sunlight. If you remove the high contrast of black on white by adding touch up paint you should already have a visual improvement of 70-80%. Then the challenge lies in filling the damage as much as possible, without making it look globby, to eliminate the shadows. Below is a small sample of the shadows that can be cast. The color of the touch up is off (this is not a photo of our touch up) but the worst part is the shadows. Shadowing caused by 3D effects of paint damage. We take great care to eliminate as much of the 3D effects as possible. The finish will never be completely flat as it would be with a full repair but in most cases it will take close inspection to notice.